So without further ado, here are 8 things you can do today to increase your odds of connecting with an expectant mother with an adoption plan. There are many ways to connect with a prospective birthmom. And the best way by far is through word of mouth. It doesn’t cost anything and it’s easy to do. Or at least, for some people it’s easy. Others, however, would rather have root canal before they tell someone that they’re adopting. If you fall into this category, no worries. Not everyone feels comfortable talking about adoption or reaching out directly to prospective birthparents. But you should also know that you’re missing out on a great opportunity. Yes, telling people that you’re trying to connect with a prospective birthmother can be awkward and trigger some strange responses. But most people you reach out to won’t mind. In fact, they’ll be happy to help you. And many prospective birthparents will be as excited to hear from you as you will be to hear from them. So don’t be afraid to spread the word. The more people who know about your adoption plan, the better the odds are of achieving it. Maybe you thought your agency would find you a match by now. Or maybe you didn’t realize how hard it would be to get chosen by a prospective birthmother. Or maybe you just hoped that eventually you would get lucky. Whatever the reason was, last year you decided that you didn’t need to have your own website. But this year? Maybe it’s time to re-think your strategy. Keep in mind that one of the first places that prospective birthparents go when they’re looking for information about adoption or for prospective adoptive parents is online. So increasing your internet presence there can’t hurt. Websites aren’t just for big organizations any more. Nor do they have to be complicated or costly to create. With a bit of research and planning, you can get a personalized site created for you quickly and cheaply and expand your opportunities to connect with prospective birthparents who are looking for families on the web. Creating a website is a great way to increase your online exposure and get noticed by a prospective birth family. But as anyone with a site will tell you, just because you build one doesn’t mean they will come. No matter how good your website is, you still need to find ways to get people to visit it. And the best way to do that is through SEO — search engine optimization. Learning which keywords prospective birthmothers use to find adoptive parents and then applying that knowledge to all of your online activities can help you get found and noticed easier. For instance, this blog post is targeted to prospective adoptive parents who are trying to find a match with a prospective birthmother, and as a result those are the words that are used in the title. Knowing your way around keywords and search engine optimization will not only give your website the leg up, it will give add value to all of your online activities, including social media. What’s the point of creating a great profile or having a great message if the people who are looking for you don’t see it? It’s free, simple to join, and has huge reach. What is it? Social media. Everyone’s doing it, and you should be too. Check out Facebook, Twitter, Instagram and Pinterest, if you haven’t already, and find the network that’s best suited to you. Social media is an amazing way to reach out to others in the adoption community, and perhaps eventually have them reach back to you. But don’t just set up an account and start bombarding people with requests to connect you to prospective birthparents. That’s spammy. Instead, go into it for the long haul and add value by joining conversations and helping others discover and share interesting people and content. Want to increase your online visibility? Start a blog. Blogging is a tried-and-true way to stand out and connect with others who have similar interests. With tools like WordPress and Tumblr, setting up a blog has never been easier. Just remember that setting up a blog is one thing. Keeping it going is another. If you’re not ready to make a commitment just yet, try guest blogging first and see how you like it. Major websites are always looking for guest bloggers. And we are, too. So if you have an adoption story or tips about connecting with prospective birthparents that will inform and inspire other waiting parents, tell us about it any time. When your agency initially sent you a form asking you what kind of baby you were hoping to adopt, you probably checked off a couple of boxes and forgot about it. Maybe you said “no” to “special needs”. Maybe you said “no” to adopting a child of another race. When it comes to adopting, it’s important to know what you can take on and to keep your expectations realistic. But being picky also has its drawbacks. It can paint you into a corner and add years to your wait time. So now that you’ve waited a year and have had time to explore things in more detail, you may have a different perspective. And you may want to go back and revisit that checklist with an eye on making some changes and expanding your options and opportunities. Creating a website, starting a blog, and mastering search engine optimization don’t happen overnight. They take effort and time. How much time? It all depends on how quickly you work on them and pick things up. But suppose you don’t have time. Suppose you’re in a rush. Suppose you want to see results now. What do you do then? Why not do what a lot of waiting parents are doing today: Advertise. Tools like Google Adwords or Facebook ads can give you an instant online presence and help you stand out. And they’re pretty cost effective too. But be careful: if you’re not careful, you can burn through your budget in no time. Start slowly and gradually expand your campaign once you get the hang of it. Knowing what keywords, times and geographical locations to use can also help you save money and make your campaign more targeted and effective. Last year you didn’t get a lot of love from your adoption worker — you might have received an email or a call about a possible situation every now and then, or you might have heard nothing at all. You thought about contacting her, but in the end decided against it. She’s probably busy enough with other things, you told yourself, why bug her with my problems? But now that another year has gone by, there’s a new urgency to your search. You realize that finding a match is a lot more important to you than worrying about whether you’re bothering your adoption worker. So why not call her more often this year? At the very least, it will get you on her radar. And you never know, a situation could suddenly come up that would be perfect for you. Matches happen for all kinds of reasons. But many times they come down to something as simple as being in the right place at the right time. Connecting with the prospective birthmother that’s looking for you and building a family through open adoption isn’t easy. Sometimes it can a year, other times it can take several years. So if your efforts last year didn’t pay off, this year it’s time to try something new. These tips can help. And if they don’t work, you can always try new ones. As long as you keep going and don’t give up, eventually you’ll succeed. 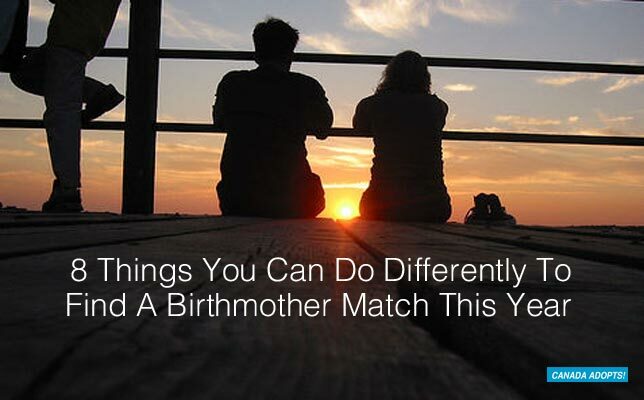 What are you doing differently this year to find a match with a prospective birthmother? How are you reaching out to prospective birthparents? Tell us on Facebook and help us raise awareness about adoption by liking our page.